The high mountains seem to whisper and breath in and out with flurries of wind that carry a cool glacial breeze from the valley to the peaks. Yet, truth be told, my current setting was unlike any alpine wilderness I’d laid eyes on before. Being 9,000 feet up is always a special experience, but even more so when a horizon of jagged peaks and endless snow caps glows golden, the humble purple and blue skyline serving as a backdrop that could be a portrait in itself. Time seems to stop while watching the colors of the sunset illuminate against the sky, while the sneaky sparkles of stars begin to uncover themselves in the black, ever-expanding depths of the universe. Eyes weary and limbs withered, I seemingly could do no more than gaze in enchantment at what lay around me. Yet a gaze was all that remained necessary as the 360 degree view of a mountain ecosystem flooded my eyes. To my right sat the Sahale Arm, the arduous pathway that had led me amongst the forests of the valley floor to the snow pack on which I currently sat. On my left stood a maze of glaciated peaks that wound in and out of one another, dotting the horizon dozens of times over, mile after mile. Behind me, sat my campsite at the toes of the Sahale Glacier, the peak of Sahale Mountain watching from its perch some hundreds of feet above. 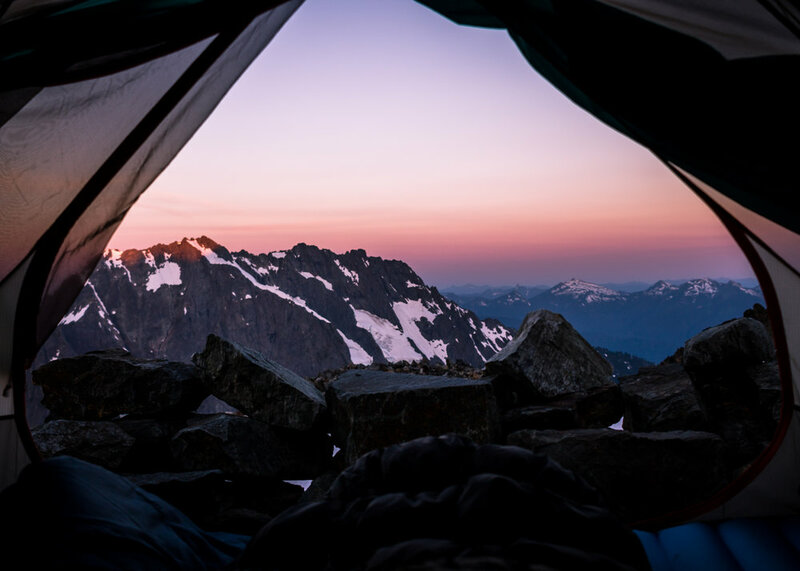 As the sun crept to its final brief resting point, I thought back to the journey that had led me to the Sahale Glacier of North Cascades National Park. Limited sleep, endless nighttime driving, and a constantly hungry stomach predated my first few steps upon the trail; however, any notion of negativity seemed to vanish in the moments that my boots touched the dirt trail below. By no means was the journey easy. 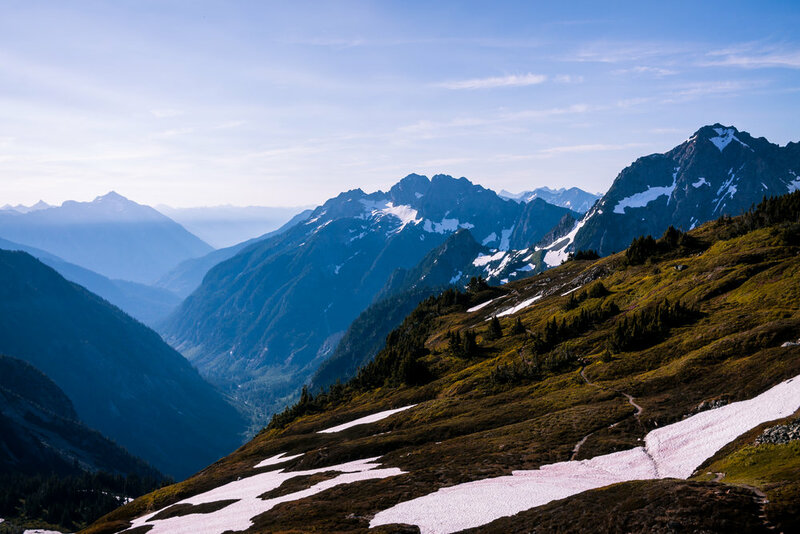 In fact, it was my second backpacking trip within five days, as I had spent the previous weekend in the depths of Olympic National Park. Though the beginning of my Sahale trek consisted of endless switchbacks, the impeccable view of Johannesburg Mountain served as a constant reminder for what lay some seven thousand feet above, as its massive body appeared perfectly balanced between the greens of a summer pasture and the whites of a snow packed peak. Switchback after switchback, The Cascade Pass trail wound its way up until it finally emerged into the first snow-pack crossing. Roughly two hours and several thousand feet into the trek, the payoff had already shown itself, as Pelton Basin stood directly in front of my vision. Blooming wild flowers caressed the faces of the mountains on either side of where I stood, creating a spectrum of colors that ranged from vibrant pinks and yellows, to solemn purples and blues. The basin continued for miles, eventually leading up into the far off peaks that made up the other side of the Cascades. From here the trail split into two, one that led to Mount Stehekin and the other that led farther along the arm and up to Sahale Glacier some 3,000 feet above. The following hour stood as the biggest test of all, as it required a steep ascent of the Sahale arm. Weeding in and out of snow packed rock formations, the risk of slipping was far too prevalent. After an hour of consistent steep hiking, the vertical angles gave way to friendlier slopes, revealing an immense grouping of more blooming flowers. The peak stood visible some 2,000 feet above where I rested. Hugging the side of the Sahale Mountain, the toes of the glacier could be seen to those who squinted hard enough. As the weight of my pack continued to set in, my previously quick pace slowly faded. It became even slower upon reaching the final section of the hike: A 1,000 foot incline of strictly loose rock. I treaded slowly and cautiously for the first ten minutes until I again saw a glimpse of the glacier above my head. A rush of hiker's high flooded my body, pushing all my sense towards my final destination. A crack of light, just powerful enough to see the few necessary feet in front of me, guided me to the edge of my campsite. It was 4:45am and the cool mountain air filled my lungs as I dove my sore wool socked feet into my flip flops. I slowly crossed the glacier pack, immediately regretting my lazy decision to ditch my boots, as the snow slowly stuck to my feet. Yet I quickly forgot about this as I was greeted by a morning visitor slowly making his way up the steep face of the ledge in front of me. A mountain goat, curious about the strange creatures spending the night on his mountain, wandered up ten feet from me, the backdrop of the emerging Cascades glowing ever so slightly. 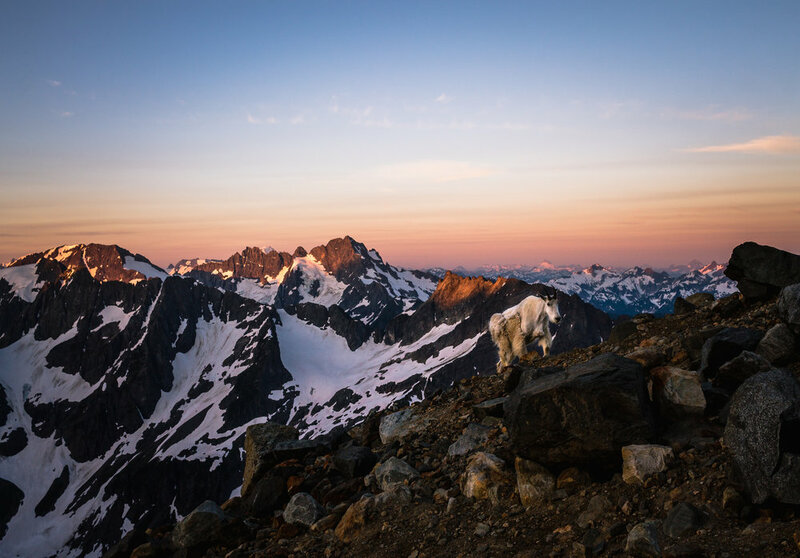 As the sun continued to rise, I reflected on my time spent on the Sahale Glacier. Having covered all types of terrain, from dense jungles and tropical beaches, to lofty peaks and dry deserts, something had changed my view of Mother Nature overnight. An ocean lover at heart, a new sense of connectivity had seemingly arisen. No longer were the mountains a clear second choice. While the ocean lies at my heart and my soul, the mountains command a respect previously never felt in my being. The ocean is such a vast body, inspiring realizations of truly how large the world and universe are. The mountains remind us of the unique creations and complexities that exist in the core of Earth. While the ocean has my heart, the mountains have my attention and I wouldn't have it any other way.